PT Bank DKI – Bank DKI is a well-established regional government-owned banking company in Indonesia, based in Jakarta. Its businesses include Consumer Banking, Retail Banking, Micro Banking, Commercial Banking, Treasury Banking. Bank DKI is regional government owned enterprise of Provincial Government of DKI Jakarta and is majority-owned by the Provincial Government of DKI Jakarta. As of December 2016, 99.98% of its shares are held by the Provincial Government of DKI Jakarta and 0.02% remaining shares by PD Pasar Jaya. Bank DKI was first established in 1961 and originally registered as PT Bank Pembangunan Daerah Djakarta Raya. After several changes in name and status, the name of PT Bank DKI officially launched in 2008. Bank DKI supported by 273 offices/outlets, including 36 branch offices, 73 sub branch offices, 104 cash offices, 14 functional cash offices, and 46 payment points throughout Indonesia. In term of financial performance, Bank DKI managed to recorded good performance in the business year of 2016. Bank DKI booked total assets of Rp 40,567 billion in 2016. This reflected an 4.99% increase from Rp 38,638 billion in 2015. Total income after tax grew by 178.02% from the previous year, from Rp 232 billion in 2015 to Rp 645 billion in 2016. This figures was stated by Bank DKI in its Annual Report 2016 as cited by JobsCDC.com. Have SIM C and personal motorcycle is a must. Minimum Bachelor (S1) holder with minimum GPA of 3.00. Minimum 1 year of experience in marketing or collection in banking industry. Minimum 2 years of experience in micro banking. Minimum 2 years of experience in leading unit in banking industry. Good looking and have good communication skills. Have a proportional body shape. Previous experience as customer service / administration is preferred. Previous experience as Teller is preferred. JobsCDC.com now available on android device. Download now on Google Play here. Please be aware of recruitment fraud. The entire stage of this selection process is free of charge. 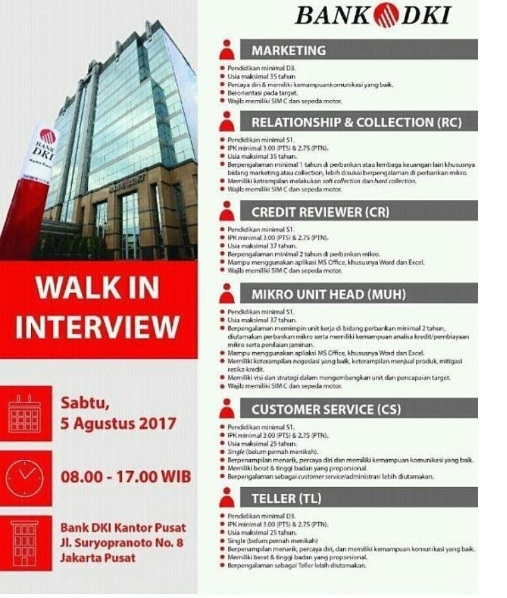 PT Bank DKI – Walk in Interview D3, S1 Staff, Head Bank DKI August 2017 will never ask for fees or upfront payments for any purposes during the recruitment process such as transportation and accommodation.